myCharge Adventure Xtreme: Portable Power Outlet | Nerd Much? myCharge has announced a brand new line of chargers for your devices at CES 2018, the most impressive of which is easily the myCharge Adventure Xtreme, a portable power outlet. It’s intended for the heavy power user who needs to keep their devices powered, but those devices use an AC outlet. Surprise, the myCharge Adventure Xtreme has an AC outlet. 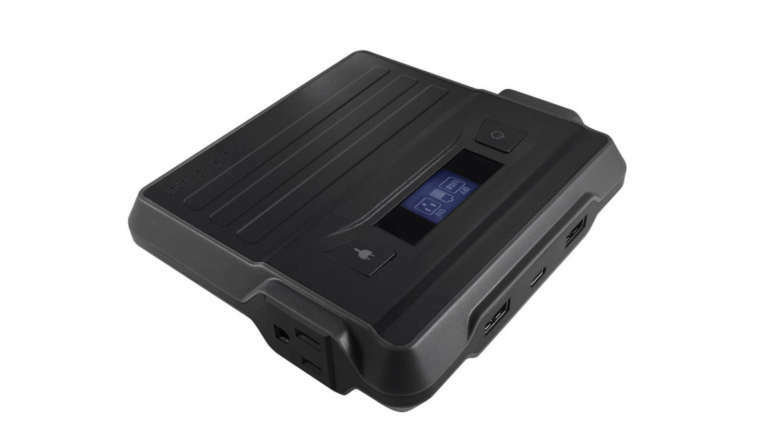 The Xtreme offers 20,000 mAh of backup power (just shy of the mophie Powerstation AC’s 22,000 mAh), and it features USB-A, USB-C, and an AC outlet port. The AC outlet pushes out 65-watts of power, allowing you to run a 32-inch TV for up to four hours, most laptops, a fan, or other devices on-the-go. It also has 10W Qi Fast charge for wirelessly charging certain smartphones. myCharge also announced a slew of other devices in the Adventure series line, including the Adventure Mini (3350 mAh), Plus (6700 mAh), Max (10,050), and Ultra (13,400 mAh). While not the best-looking devices on the market, there’s no denying that it’d sure be handy to have a portable power outlet for your laptop when you’re on a business trip or are working in the field. It’d also prove itself useful for backyard barbecues and tailgating or camping. Hell, you could bring that 32-inch TV with you on a camping trip and never have to leave your tent. The myCharge Adventure Xtreme will debut at CES 2018 and is available for $179.99 now via myCharge.com. For more of the latest cool stuff out of CES 2018, stay tuned to Nerdmuch.com. You can also follow us on Twitter for timely updates.